Sunpenny Publishing Group: Guest post from author Valerie Poore: The inspiration for her newly released book The Skipper's Child! Guest post from author Valerie Poore: The inspiration for her newly released book The Skipper's Child! 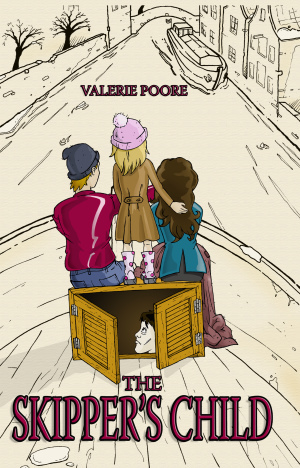 The Skipper's Child by Valerie Poore was released this week and it is the first book in our new imprint for children and teenagers Sunberry. The Skipper’s Child - inspired by my own skipper’s child! There are all sorts of reasons why a writer is compelled to write, but that’s the point really. The compulsion. I have been writing stories since childhood. I have also been a voracious reader since childhood. At the age of 12, I was reading a book every two days or so, and the books I loved were read several times over. One of my favourite authors was Elizabeth Goudge with The Little White Horse being absolutely top of my list. I also loved the Railway Children by E. Nesbitt, as well as all the other stories written by these two great writers. I am still a voracious reader, and when I decided to try my hand at a full length fictional book, I remembered these favourites of my early teenage years. What I loved about them was that although they were stories for and about children, they had some substance to them. They were for children but not childish in their exploration of feelings and ideas. They were what I have come to call ‘kidult’ books. I suppose this why Harry Potter has also had such enormous appeal. JK Rowling has tapped into that special area of fiction that can appeal to both the very young and the much older. The stories of my youth did much the same, as I remember my parents enjoyed them as much as I did. Anyhow, going back to my own writing, I decided I wanted to try and write a ‘kidult’ book. I also wanted to write something I would enjoy reading as much as I enjoyed writing it. The inspiration for the eventual story came from my partner. When I first came to the Netherlands and moved onto a barge, I became fascinated by the lifestyle of the commercial skippers who plough their way up and down the inland waterways of Europe. It all seemed so romantic. However, Koos, my partner, soon destroyed the romance of that image. He was born a skipper’s child and the stories he told me about his early years were intriguing because it was such a different way of life. But what also came through was that for a child on board, it was incredibly boring (excuse the pun). There was nothing to do and nowhere to go. I questioned Koos endlessly about his background, his family and his life. The anecdotes his own parents had told him about smuggling and secreting not only goods but people across borders during the war and post war periods were quite thrilling. For me, it didn’t sound boring at all, but I could well imagine that for him and his sisters, most of their life was routine drudgery: cleaning the ship, coiling and uncoiling ropes and cables, endless locks, eternal ribbons of canal with nothing much to view on either side except lonely farms. I started musing about a story in which a bored skipper’s child finds adventure. I wanted to set it in the period when Koos had been a child, the early sixties, and so I decided on 1962, the year of the Great Winter. I also thought it would be nice to give it a Christmas focus. My musings were what have led to this, my first, and I hope not my last, complete novel. I so hope my younger readers will get caught up in Arie’s story as much as I did, and that it will be a book they will read not just this Christmas but in the following years too, just as I did when I was their age. Thank you Valerie for that fascinating insight! If you're interested in purchasing The Skipper's Child, it will be available from all good online stores such as Amazon by over the next few days; meanwhile you can order directly in time for Christmas by emailing orders@sunpenny.com to request your copy. Price is £7.99 plus a post and packaging cost of £1.50. To find out more about Valerie, you can visit her website. Look our for more news on The Skipper's Child on here and our Facebook page!